Or something like that. Earlier this week, I wrote that Marc-Andre Fleury might have seen the last of his days as the Pittsburgh Penguins' starting goalie. After another stellar performance by 36-year old goaltender Tomas Vokoun, that theory is starting to pick up some steam. Vokoun has played too well for anyone to even think about putting Fleury back in. In three starts Vokoun is 3-0, with a goals-against-average of 1.28, and the best save percentage in the playoffs now of .957. Vokoun has stopped 101 of 105 shots that he has faced while winning three straight games. So why are people still questioning the starting goaltender job for the Pens? Why are people saying that Fleury deserves another chance? It shouldn't even be a question. Fleury played poorly, giving 14 goals in four games, going 2-2. Some of the goals that Fleury gave up were just unacceptable, and this is coming from one of his biggest supporters and defenders in the world. 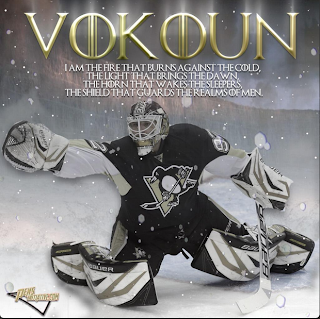 The fact is Vokoun has taken this chance and run with it. In fact, the Pens brought Vokoun in for this very reason, to offer a confident, veteran, and capable backup to steady the ship if Fleury melted down in the postseason again. That is exactly what is going on and everyone needs to just come to terms with it. Do I feel bad for Fleury? A little, I think Fleury is obviously better than what he has shown. I think Fleury's resume speaks for itself, over 250 career wins, all-star, picked to 2010 team Canada, and Stanley Cup champion all before the age of 30. But now something is wrong with him in the playoffs, he can't stop the damn puck, and he lets in soft goal after soft goal. Fleury did have a shutout game one against the New York Islanders when the team in front of him played better. But, Vokoun faced a barrage of shots in game six against the Islanders, and guess what, the Pens still won the game and the series. I'm not sure if this is the end for Fleury, I think it's a little premature to talk about. We'll get a better feeling with that as the playoffs progress. If the Pens go on to win the Stanley Cup with him on the bench, I certainly think they will have to entertain the thought of moving Fleury. And I have no doubt that the Pens can win the Cup with Vokoun. If Chris Osgood, Anti Niemi, Cam Ward, Jean Sebastien Giguere can all win the Stanley Cup, there is no doubt that Vokoun (just as good as those guys) can win one this year. I have even little doubt given the fact that this Penguins team is stacked from top to bottom. Vokoun just seems so comfortable out there. He is making most saves look so routine while looking so calm in net. I'm not a psychic but Vokoun just seems like he's having fun playing on a good team. Vokoun reminds me of Mike Vernon with the Detroit Red Wings circa-1997. Vokoun is and has been a good goalie in this league, he's just now getting some real playoff experience at a weird time in his career. Instead of thinking it in terms of bashing Fleury, you should just think of it as praising a 36-year old goalie who is finally playing on a good team at the twilight of his career. People should feel good for Vokoun more than they should feel bad for Fleury. I believe Fleury will go on and have the same kind of career that he's been having, but for now it's about playing the guy that gives your team the best chance to win. Right now that is Tomas Vokoun. I'm not quite sure what it would take for Vokoun to lose his job either. At least, I hope that it's not that easy. I would think think that Vokoun would have to give up four or more goals in a loss while throwing the puck into his own net. Or perhaps if the Pens lose two straight games with Vokoun being just good not great, maybe Fleury gets back in to provide a spark. Having either Vokoun or Fleury as the alternate option is actually a good thing, unless Fleury comes back in and plays no better. In the end this isn't about feelings or doing what's fair to Fleury. It's about winning a championship and doing what's best for the team. If you want to talk about being fair you have to consider rewarding players for playing well. The Pens will not win a Stanley Cup with while giving up four or five goals every game. I don't think they have to worry about that with Vokoun.